Jane Lynch and Carol Leifer were among those who performed at a PETA benefit earlier this week. 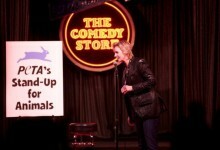 “Stand Up for Animals” was held at the legendary Comedy Store in Los Angeles. Lynch and Leifer were joined by Bill Maher, Fred Williard, Marc Mahon and Jeffrey Ross in entertaining the star-studded crowd which included Pink, Olivia Munn and Seth MacFarlane. Proceeds from the benefit—including purchases from a special “veganized” version of The Comedy Store’s menu—will go toward PETA’s work to stop animal abuse.